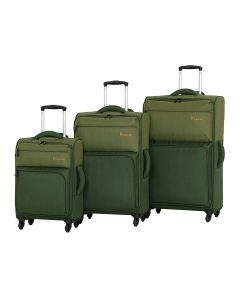 it luggage DuoTone is a three-piece modern set of very light, robust and spacious soft shell suitcases with four wheel spinner suitcases with many color options. Each bag has the spinner wheels that rotate 360 degrees and offer easy maneuverability, with the solid telescoping handles. You’ll find two front zipped pockets for the items that you wish to access easily at the airport, like your passport or boarding pass. The fully lined interior has a large zipped mesh pocket one side for your smaller stuff and the two elastic straps on the other side to keep your clothes in place. The side and top padded grab handles will let you lift the bags the way you feel comfy. The special unique design case base platform makes these suitcases stronger and more stable. The lightweight aluminum tubes on the trolley system helps decrease the weight when you’re carrying the luggage and make it feel stronger. The smallest cabin bag weighs only 4.4 pounds and measures 21 x 14 x 8.5 inches including the wheels and handles. It is suitable as carry-on bag on most global and domestic airlines and will fit in the overhead bin above your seat very easily on all flights. The medium bag is 5.25 pounds with the dimensions of 26.2 x 16.9 x 9.8 inches and the large suitcase is 5.95 pounds and 30.1 x 18.9 x 10.6 inches. Please note that these bags are expandable and they are spacious inside with or without. The DuoTone is a very reliable and durable set of three practical and functional, lightweight and durable bags that look nice and modern and will hold up over many trips. 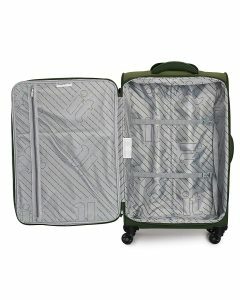 They have the sturdy spinner wheels, solid telescoping handles, external and internal pockets, spacious interiors, and many dual color options and are sold at a reasonable price at the moment on Amazon.com. If you take the photos of your luggage before your flight and check for any damage after the flight as the it Luggage will honor the long warranty you get with these bags- fix or replace. The DuoTone is offered with a warranty of ten years by it Luggage with more than three decades of history, as an indication of a company that stands behind their good quality products. *The color options include Avocado/Rifle Green, Dark Purple/Potent Purple, Pewter/Black, Potent Purple Top Half/Magnet Bottom Half, Tritex Red Clay Magnet, Charcoal Gray Black, Orange Combo Red Dahlia, Grey/Black, Teal Green Steel Gray, Tritex Potent Purple Dark Gull Gray, Tritex Original Grey Black, Grenadine/Dark Blue, Potent Purple/Dark Gull Grey, Tritex Dress Blues Sky Captain, Fuchsia Red/Magnet, and Capri Breeze Dress Blues.